Real play is messy. Children NEED to find all of the "stuff" they want/need for their play. They need to move(transport) stuff and the only timeline they follow is their own. The photos posted of immaculate, clean classrooms are not "real"... they don't capture the true essence of what childhood play is. Because let's face it. .. real play is messy. 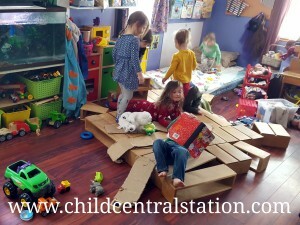 When children are truly engaged and have delved deep into play, the very last thing on their minds is how tidy the room looks. Our perspective of beauty and mess can be very different from that of a child. 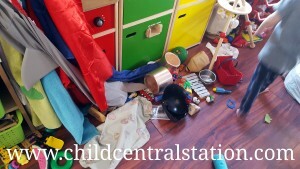 Our space often looks like a tornado came through with clear evidence and remnants of play. Random piles of favorite things stashed and mountains of "play piles" or residue abounds. The truly important work of children is play and discovery, not tidy and clean up. Clean Up time is not the most important time of day. It can often be the most challenging time of day for teachers. It becomes a power struggle, and a serious source of frustration. Children are not always done and we are asking them to stop and to completely change their world of play, and why? A lot of the time we don't clean up. We have very few transitions in our day, but when we do, sometimes the children are just not done. So, we leave whatever they were playing and give them the opportunity to come back to it. If we really truly value children's play, and we really truly respect their investigations we allow them to come back and to pick-up or revisit right where they left off. 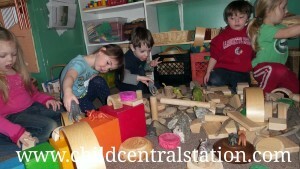 When children can pick up where they left things, they can delve even deeper and develop more complex play. If we are constantly cleaning up and having to start over, the children may only scratch the surface in their play, especially if they do not have a long enough period of time. I like to think about it this way... As an adult when you are working on something, let's say writing a letter. If you start it and do not have enough time to finish it in on sitting, you don't scrap the whole thing and start over. You save what you have done and you come back to it. So, why do we expect children to clean up and start all over again? Young children may not be developmentally ready to clean up. They are really good at dumping and taking things out, but putting things away is a different task, and requires a different skill set. The expectations we have for them may not be appropriate. So, clearly there are times when it is necessary to clean up. How do we handle that here? Well, sometimes we ask the children to help. We know that some children will and some children generally don't. (and that is okay!) Most of the time, the adults do the cleaning. Generally when I start to clean up, a few children will opt to help me. On very rare occasions everyone will help. Sometimes we just bulldoze the mess out of the way and I deal with it later. If there is a plan and an amazing idea/learning opportunity that is being proposed and we need the space, the plan takes priority over the mess! A pile we "bulldozed" to the side to make room for more play. Unfortunately, we have a limited amount of space, which means that the children nap where we play. This means that the area needs to be cleaned prior to naps. Most often, the cleaning happens primarily by an adult while the children are eating lunch. (In our program we have 2 adults and up to 12 children on any given day. One adult assists with lunch while the other cleans and sets up for nap). 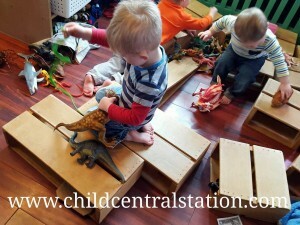 When there are amazing structures, forts, or other pieces of play the children are highly engaged with, we try to take photos and sometimes even move them or sleep around them. Otherwise out of necessity, the remnants of play are returned to the shelves. Dan Hodgins and I discussed this very topic in the second episode of The Shakin' Bones podcast. If you have not listened to it yet and would like to, Here it is! (Click on Episodes and choose episode #2 Clean Up). How do you handle clean-up? 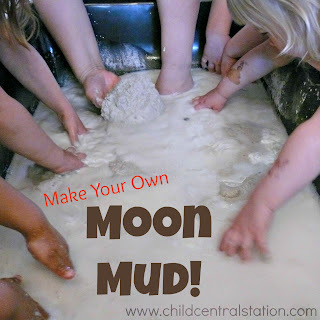 Where do you find the balance between clean up and play/exploration? I'd love to hear from you! Feel free to comment below or hop on over to my Facebook page and join the conversation.